A dairy free vegetarian recipe to use up hard cooked eggs, this avocado & egg salad sandwich is extra creamy thanks to hummus plus the colorful crunch watermelon radishes. Welcome to day 3 of #EasterWeek hosted by Bernadette from Rants From My Crazy Kitchen! I'm a practical cook yet I tend to creativity in the kitchen. Planning meals is NOT a paper and pencil exercise, it's more me staring at the fridge and seeing what containers I can empty to create space. Turning bits of leftover meats into pizza toppings is one inspired way I keep our family's Friday Night Pizza Night interesting, as described in My Pizza Primer. Adding Community Supported Agriculture (CSA) produce to the family meals is a constant source of inspiration--actually the purpose of this website. Repurposing leftovers is yet another source of inspiration for me, and the reason for today's recipe. 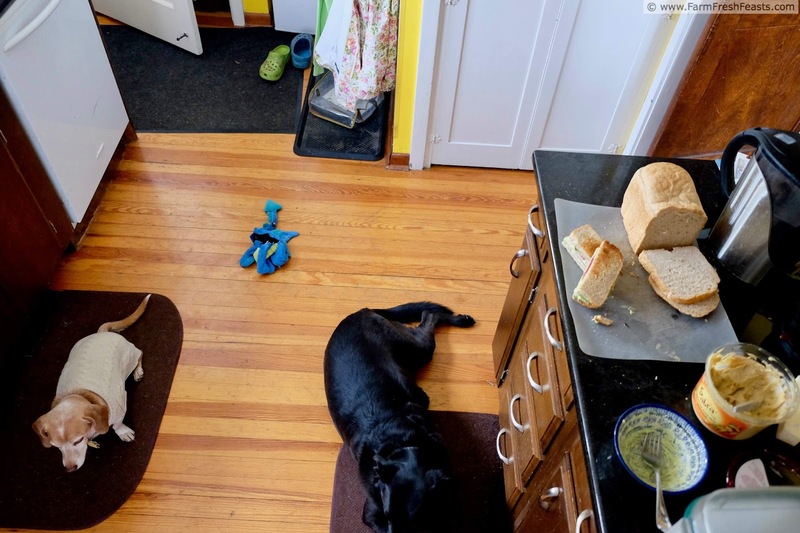 Vincent and Simon are waiting for a crumb to fall. Any crumb. They aren't picky. 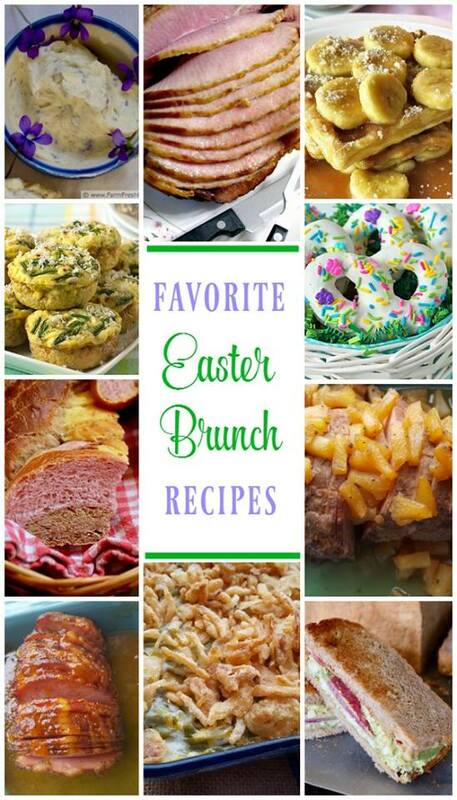 If you use hard boiled eggs for your Easter egg creations, you end up with a bunch of [leftover] hard cooked eggs. I buy locally grown eggs at the farmer's market or get eggs from friends with chickens. Since I have on occasion looked into the eyes of the ladies who produce my eggs, it's even more imperative not to waste food. Therefore, I'm always on the lookout for tasty ways to use hard cooked eggs. When I made my Savory Avocado and Egg French Toast I knew that avocado + egg is the flavor equivalent of a buddy movie. Much like peanut butter & jelly or bananas & Nutella or sautéed beet greens & sherry vinegar (or Swiss chard & malt vinegar, or spinach & red wine vinegar . . . maybe I should just say "Greens & Vinegar"), the combination of avocado + egg + salt is greater than the sum of its parts. I'm not sure why it took me so long to mash up an avocado and add it to an egg salad sandwich, but we're all glad I did. 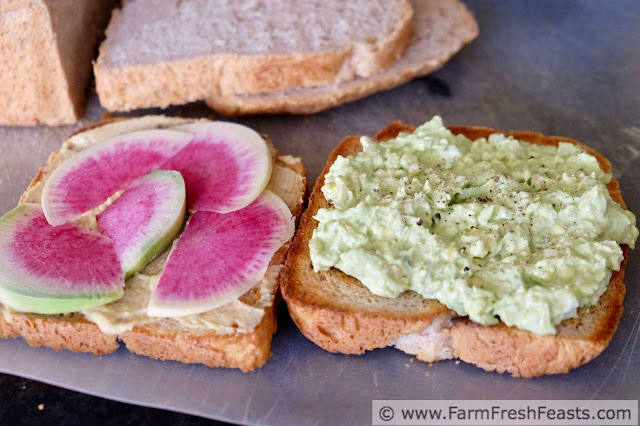 Paired with a watermelon radish from the farm share, this combination of flavors, textures, and colors turns what could be a simple sandwich into something worthy of placemats, cloth napkins, a vase of fresh flowers. Eat this sitting down at the table, not standing over the sink. I feel compelled to point out here that you are worthy of a nice meal, even when you're eating a simple sandwich and even when you're all by yourself. Just like Albert, Frances' friend in Bread and Jam for Frances. Albert sets up a lovely lunch on his desk at school and makes the sandwich, the pickle, the egg, and the milk all come out even. He's a good role model, and that's a great children's book. For more recipes using avocados, please see my Avocado Recipes Collection. For more recipes using radishes, please see my Radish Recipes Collection. They are part of the Visual Recipe Index by Ingredient, a resource for folks like me eating from the farm share, the farmer's market, the garden, the neighbor's garden, and great deals on ugly produce at the grocery store. In a small bowl mash together avocado and egg(s). Stir in mayonnaise and seasonings until combined. Taste to make sure you don't want a bit more salt or pepper. Toast bread until lightly browned. 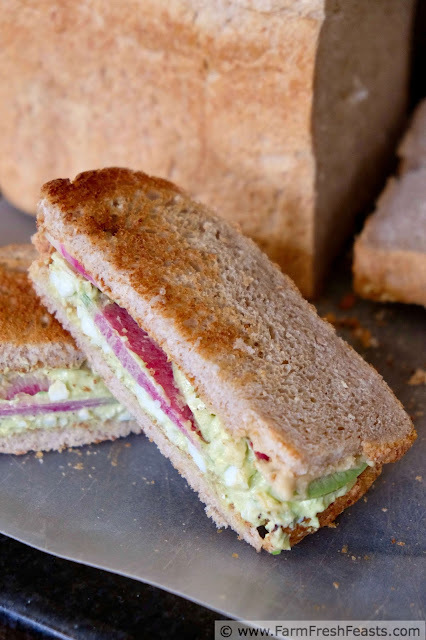 Spread one side of bread with hummus and the other with egg salad. 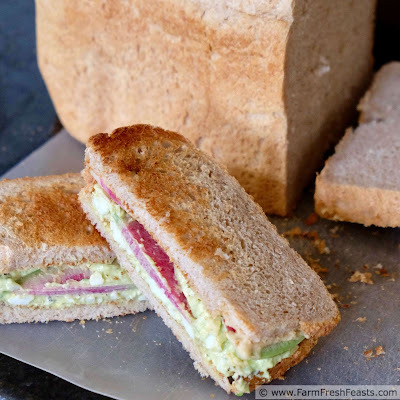 Top with radishes and assemble sandwich. Enjoy! 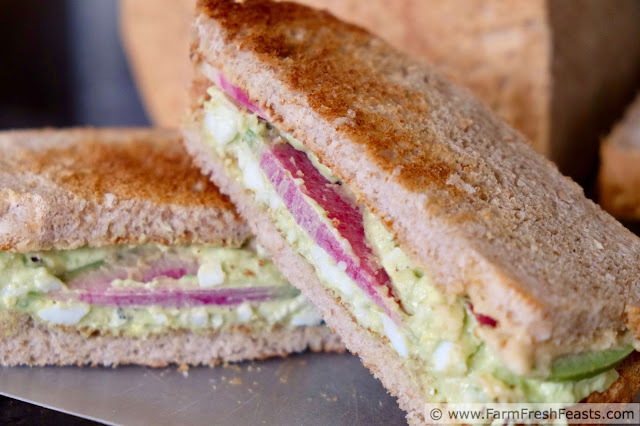 Green Egg Salad Sandwich from Farm Fresh Feasts hey that's me! 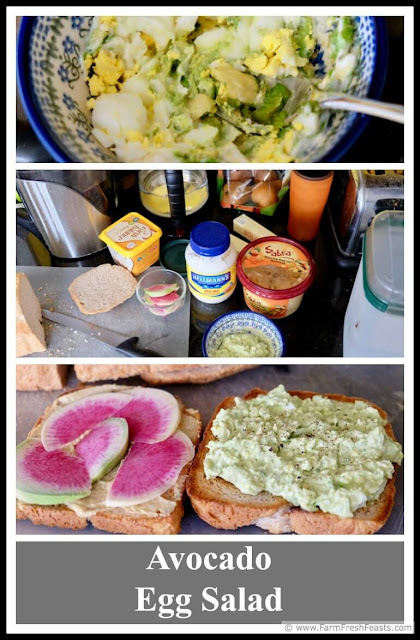 I've had the avocado egg salad on my radar for years and still haven't given it a try, which is silly because I love both avocado and egg salad! Will have to try this one. Yumm! I love avocado and eggs together. Those radishes add the perfect crunch! I like the idea of adding an avocado to egg salad. 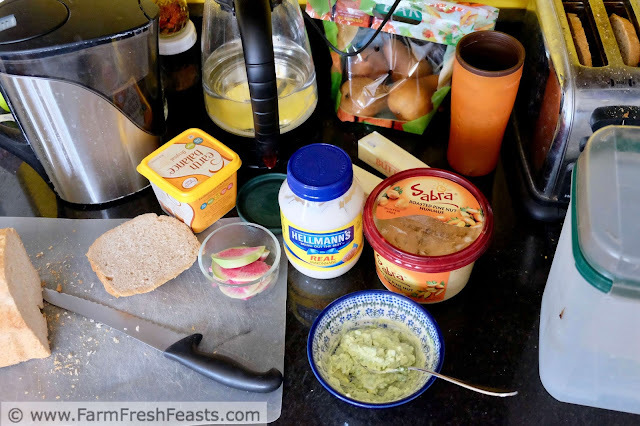 We actually use hummus to make ours since we rarely have mayo on hand. For shame I know. Thanks for the book recommendation. I'll check it out.